In 2013, the captain of a commercial lobster boat started a Facebook group. And while that in and of itself is not unusual, the fact that this captain is a woman is. The name of the Facebook group is “Chix Who Fish,” and it is a group created with the intention of bringing other women in the fishing industry together. More specifically, Chix Who Fish was designed to address the lack of female foul weather gear for women who work on commercial fishing boats. So far, the social media campaign was successful in gaining the attention of Grundens, USA. The company worked with the group to create a line of professional rain gear specifically for women in the industry. What Is It Like to Be a Woman in the Commercial Fishing Industry? In addition to the Facebook group, the female captain of a lobster boat is also the writer for the Chix Who Fish blog. In her blog, the fisherman explains what it is like to be a woman in the commercial fishing industry, which is mostly male-dominated. The captain describes her experience as exhilarating, nerve wracking, satisfying, frustrating and deeply gratifying. She says these feelings likely apply to all fishermen, regardless of gender or specific role they fulfill in the industry. She also said she has yet to meet a woman who proved incapable of steering the boat or tying a knot. The fisherman maintains that running a successful fishing operation involves much more than lifting heavy objects. The lobster boat captain did say the only place where it becomes obvious she is a woman in the industry is off the water, in the institutions that are on the edge of the fishing industry. This includes loan officers, sales men (including the one who rolled his eyes when asked if they made foul weather gear that fit women), trade associations, wardens and those who assume she was a crew member and not a captain of her own boat. Since the success of her Facebook group, the lobster boat captain has been pushing to create a formal, nonprofit group, which she hopes to call the Women’s Commercial Fisheries Alliance. Though the captain would love to spearhead the group, she does imagine it would detract from the time spent on fishing. Though, she says the alliance would include all women in the commercial fishing industry, including administrators, processors, scientists and crewmembers from all fishing industries. Ultimately, she hopes it the group will host programs to get women experience on the water and scholarships for younger women. It is great that a sector of the commercial fishing industry is getting a voice and an opportunity to be heard. Best of luck! 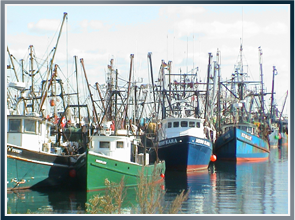 Latti & Anderson LLP is a personal injury firm that fights for injured maritime workers nationwide.